There are not many stitches that are more beautiful than this LACEY EYELET RIB STITCH. And, there are few that are easier. 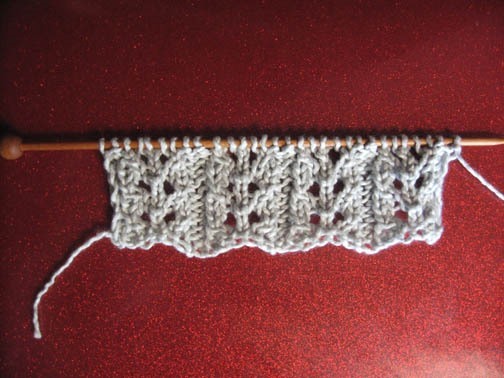 Most knitters are apprehensive about knitting any lace patterns, and truthfully, many are difficult because of so many rows. This one, however, consists of only 4 rows. You can use either side of the work and it is a lovely stitch to know. You can use it for a beautiful scarf or for just about anything for a baby. I've made many baby sweaters and blankets using this stitch. Tip: the finer, or thinner, the yarn and the smaller the needles will make a difference in how fragile or sturdy the stitch will be. I cast on 30 stitches for my sample. Do these rows over and over till your work is as long as you want it to be.